Runtastic Moment smartwatch launched. Today Runtastic launched the Runtastic Moment, a brand new wearable that combines the fashion of a traditional watch with the functionality of a modern fitness tracker. Designed to meet the needs of all types of users, the Runtastic Moment is available in four unique styles (Basic, Classic, Elite and Fun) that offer different size watch faces, types of bands and colors. Simply sync it with the Runtastic Me app and what looks like a traditional watch seamlessly turns into one of the most comprehensive fitness trackers on the market. This news comes on the heels of Runtastic announcing it was acquired by adidas Group for $240 million. The Runtastic Moment is an analog watch that allows users to track Steps & Distance, Active Minutes, Calories Burned, Sleep Cycles and Goals. Users can also monitor daily progress directly on the watch face via the Progress Indicator and set vibration alerts to go off after periods of inactivity. Waterproof up to 300 feet, the Moment can be worn during any type of activity - including swimming, diving or even showering. It does not require any charging, as it is powered by a standard battery. 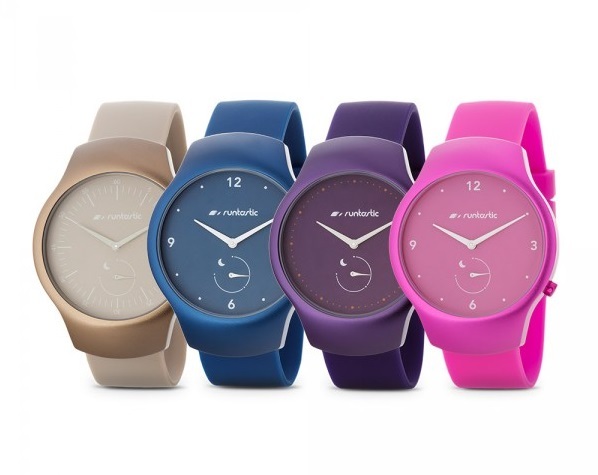 Runtastic Moment Fun: Boasting an aluminium case, scratch-resistant glass and a comfortable silicon strap, the Moment Fun was designed for the playful, active types. It is available in four colors - raspberry, plum, sand and indigo - for $129.99. Runtastic Moment Classic: With clean lines and a simplistic style, the Moment Classic offers a stainless steel case, scratch-resistant glass and a leather band - available in silver, gold and rose gold - for $179.99. Customers located in the U.S. can purchase Runtastic hardware from the Runtastic Online Shop and in select retail stores in the near future.